Dahlias can be grown as border specimens, potted plants or background plants. There are hundreds of varieties of dahlias in existence. The majority of dahlias are hybrid versions. The dahlia is a tuberous root system plant. Dahlias range in height from 12 inches to 6 feet. Flowers come in various shapes and an assortment of colors, such as magenta, pink, yellow, red, white and picotee. Dahlia plants are indigenous to Mexico and Guatemala. The Aztecs utilized the dahlia for medicinal purposes. Once dahlias made their way to Europe in the 1900s, they became a highly hybridized plant. Grow dahlias in an area that has a minimum of six hours of sunlight. Well-draining, rich and fertile soil that is slightly acidic is a must for growing dahlias. Dahlias cannot abide soggy roots. 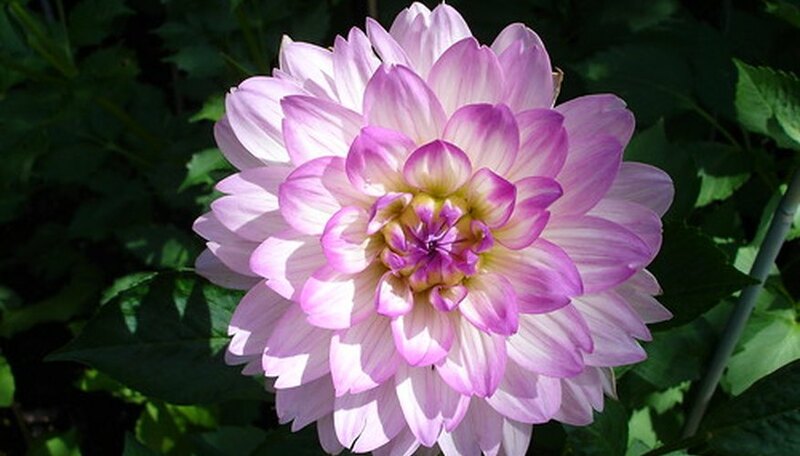 Dahlia varieties are categorized by the shape of their flowers. Varieties include cactus, ball, pom-pom, collarette, formal decorative, informal decorative, single anemone and semicactus. Dahlias attract butterflies to your garden. A compound known as Atlantic starch, an extract from the dahlia tuber, was once used to treat diabetes. The dahlia is Mexico's national flower and San Francisco's official flower. Fill containers with slightly moistened potting soil mixed with an equal amount of coarse sand. If the soil mixture is too wet, it will cause dahlia tubers to rot. Sow dahlia tubers at a depth of 2 to 3 inches and cover lightly with soil. Swan Island Dahlias, a leading grower, recommends starting dahlia tubers at least six weeks before transplanting them outdoors in mid-April through May. 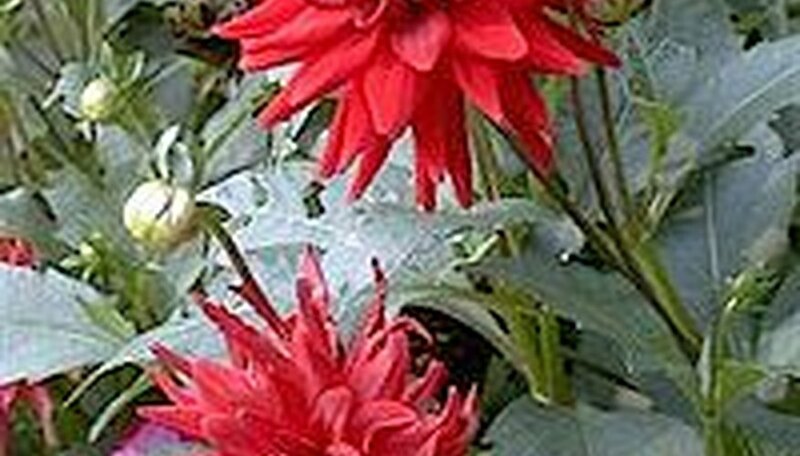 Place dahlia pots in a location that offers a temperature of at least 60 degrees Fahrenheit. Transplant dahlias when they reach 12 inches in height. Pinch back plants that are taller than 12 inches before transplanting them. Cut or pinch off the center shoot, directly above the third set of leaves. Pinch back any dahlia plants that have grown taller than 12 inches. Keep your dahlias indoors until the soil temperature reaches 60 degrees Fahrenheit. Dig a hole about 12 inches deep and 12 inches wide in a sunny area of your garden. Combine the removed soil with a few cups of compost, a handful of bone meal and a bit of lime. Shovel the soil mixture into the hole until it is about 6 inches deep. Remove the dahlia from its container and place the tuber in the hole. Fill in around the base of the dahlia with the remaining soil. Moisten the soil around your transplanted dahlias for a week to allow the roots to establish. Continue deeply watering your dahlias once or twice a week and apply a liquid fertilizer diluted to 1/4 strength once a month. Background of petal is lilac pink with a deep pink blush. Many large maroon speckles, flowers edged in white. Stargazer is an excellent cutflower. 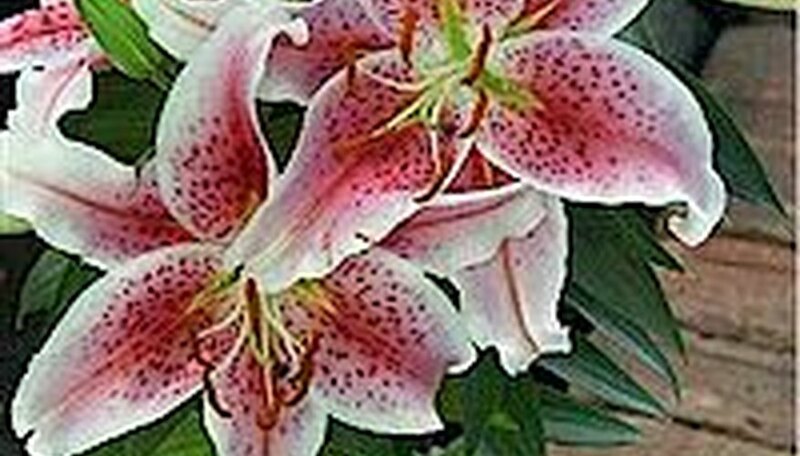 Dramatic Oriental lilies add interest to a late summer garden. Large flowers bloom atop tall stems between July and September, and their powerful fragrance intensifies as the sun goes down. 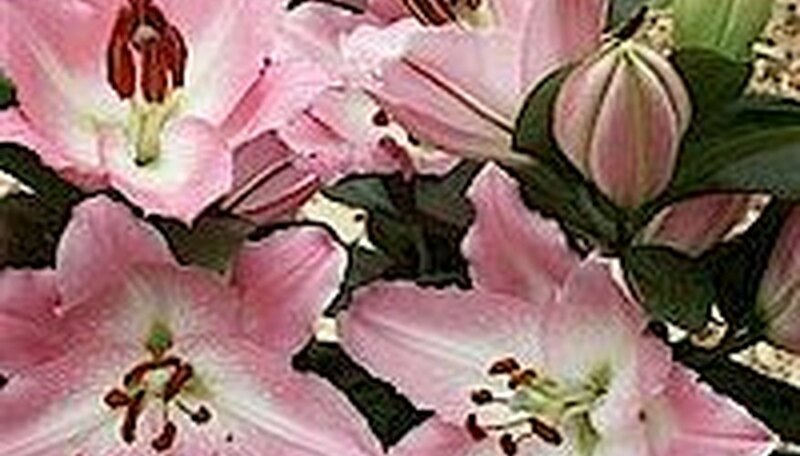 Oriental lilies can be grown in zones 3-9. Planting Method: Plant 12 inches apart in holes that are six inches deep. 5" diameter yellow flowers have lilac tips and green foliage. Planting Method: Plant the tubers 3 to 4 inches deep and 18 to 24 inches apart as early as 10 days before the last expected frost. Lifting Tubers If you live in an area where the ground freezes in winter, you will have to lift your dahlias and store them in cool but frost-free area over the winter. This usually includes zones 7 and colder. Fill a stew kettle with 2 cups of water and bring to a boil on the stove. Add the cup of dried dahlia petals to the boiling water and turn down the heat. Allow the petals to simmer in the hot water for 30 to 45 minutes. Pour the mixture through a colander into a clean bowl. The colander will remove the dahlia petals and will leave a green or brown liquid in the bowl underneath the colander. Pour the hot liquid into a coffee mug, adding your favorite condiments (honey, cream, sugar) if desired. You'll love these large, golden-yellow, decorative type dahlias. Blossoms are 4-5 inches in diameter. Planting Method: Set the tubers 3 to 4 inches deep as early as 10 days before the last expected frost. To start seeds indoors, fill a potting tray with potting mix. Plant the seeds about inches deep. Cover with soil and water gently. The soil should not be soggy, just moist. Keep the indoor seeds in a brightly lit area that is warm, above 60 degrees. Germination usually takes about 7 to 10 days. Water the seeds daily, just so the soil remains moist. Once the seedlings reach 3 or 4 inches, they can be transferred to individual pots. Once they reach 12 inches, they should be ready to be planted outdoors, weather permitting. If growing seeds outdoors, choose a site that is fertile, well-drained and in full sun (afternoon shade in warmer climates). Space the seeds in the soil 12 inches apart and about 2 to 3 inches deep. Water gently and daily until established. Seedlings started indoors can be moved outdoors to the garden in the spring, after the last frost. Once they're established, remove spent flowers to encourage more blooms. Large purple-red flowers with white tips, flowers are 5" in diameter. Medium sized soft, pretty pink flowers have creamy white centers. Strong stems with dark green stubby leaves. Plant produces many, many flowers!